1. WOMEN ARE CONFIDENT. I’ve always known women are confident, but this year I saw that confidence expressed in new and visible ways. Two examples: doctoral student Larisa Pataraia and student Mariam Perishvili showed great confidence when they stood up at Ilia University in Tbilisi, in the Republic of Georgia. In front of their peers, the U.S. Ambassador, the university president, faculty and administration. Larisa made an impassioned call to action for gender equality. Mariam spoke to the room about how she feels “good enough, strong enough, capable enough,” proclaiming, “I am the only person that can define what I am and I am not cut out for; and YES, I am just good enough.” How confident are you feeling? Do you know you are good enough? 2. MAKING WORK FIT INTO YOUR LIFE IS STILL NOT EASY. No matter how much we talk about it, and how many strategies myself and others give, women are still struggling to make work fit into their life goals. Work/Life balance is the topic I am asked most frequently about around the world. Yes, it’s tough, but women everywhere ARE making it work and you can too. Women are making the choices that work best for them and their families, I know you are too. Here is a brief, new post I wrote sharing three additional thoughts on the topic based on the questions I was asked this year. 3. WOMEN DO SUPPORT WOMEN IN GENEROUS WAYS. I began to have my doubts about this when many women I reached out to did not respond, or promised to follow up and didn’t. But I learned that when you connect with women who share your values, commitment and goals, they’ll go to extremes to enable your success. We ran a crowd funding campaign this year to raise money to be able to provide copies of UNDETERRED to university students, and raised $32,000 in 17 days. Much of it was from women, including two very generous friends of mine, Darcy Howe and Teresa Kellett. Four women in particular opened the door to huge opportunities for me this year: Molly Rydzynski at the U.S. Embassy in Tbilisi, Georgia; Colleen Larsen of Business Engage in South Africa; Laura Tapia Navarro at P&G in Mexico; and Susana Robles Garcia who enabled the funding for the Spanish translation of UNDETERRED. Not only did they make speaking engagements happen for me, they attended the sessions with me, drove me around, fed me and supported me in more ways than I can ever thank them for. Who are you supporting? 4. REJECTION IS HARD. This year was as hard as it was good. For all the opportunities I had, there were plenty of others I did not get. As much as I try to figure out the lack of response, I often cannot determine the reason. So while I continue trying to learn from what doesn’t go well, I am much more inclined to focus on pursing opportunities where things flow easily. I’ve learned that its impossible to give up when you believe strongly in what you are doing and when you have support from those who love and are aligned with your goals. So like the women I work with, I’m choosing to be undeterred! 5. MEN ARE SUPPORTING WOMEN. I walked into a university classroom in the Republic of Georgia expecting a room full of women students. Instead I was greeted by around 45 men who wanted to learn more about how they could be more supportive of the women they knew they’d be working with when they graduated. 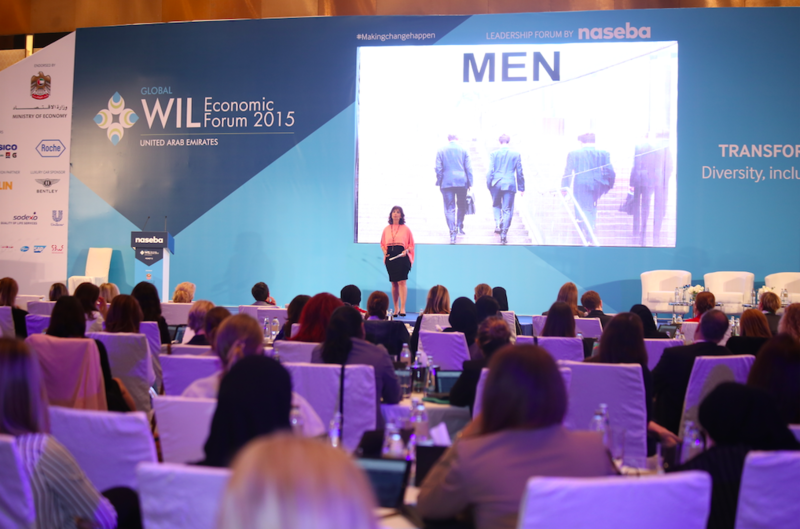 I moderated a panel with male CEOs at an economic forum in Abu Dhabi and my panelists shared what they and their organizations were doing to advance women, as well as some personal realizations about their roles as fathers, husbands and managers. In Mexico, I conducted a session for mostly male managers at P&G on how they could be more personally engaged in encouraging the success of the women on their teams. In each of these instances, I encountered men who understand the business case for the advancement of women and as importantly, they are personally committed to gender parity. I am more inspired every day by the women and men I am privileged to meet, and people like you I connect with on thewaywomenwork.com. I end this year even more committed to my mission of unleashing the business and professional success of women around the world. I know a big part of what I do in 2016 will be to work with more men, sharing specific things they can do to help women advance and succeed in the workplace. How about you? How was your year? What were your learnings? What does 2016 look like for you?